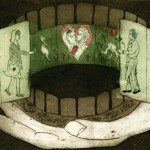 ‘The Zoetrope’ was published in Issue 2 of New Fairy Tales in 2009. These gorgeous illustrations are by Nicki Dennett. . .